Certainly if there is a merger, a new name makes sense. Is that not what they are doing in China? A JV with a Chineese auto company? China is leading the way in EV, already with 40% of the global market of EV sales. And the reason I think it would make sense even without a JV, is because an EV is so vastly different than today's product, which would work to their advantage in terms of Millennial's and their perception of the brand, as well as Wall Street. I just don't understand why some thing a new brand is necessary. So in a few years if electric becomes the standard powertrain for everything, now what? You have to continue to develop a 3rd brand that will now be the same as the regular brands? So you'd have Mercury all over again? And then do you let the Ford and Lincoln brands wither away? Is there another major manufacturer that is developing their EV portfolio as an outside brand? BMW has their i brand, but it's nothing more than a BMW sub brand as opposed to Mini which is an actual outside brand. And I'm sure once electrification spreads throughout the lineup, the i sub-brand will be come redundant and fade away. ...So you'd have Mercury all over again? ...As for the "Team Edison" naming, I think it's clearly meant to draw comparison to the competition that existed between Edison and Tesla in their heyday, and point clearly to whom they're in fact focused on! I approve! Last edited by 2b2; 09-28-2017 at 06:11 PM. If BMW can have I, which is in fact a brand, then why not E for Ford. Also a brand. Heck, Black Label is a brand of sorts, so I don't see an issue with it in the slightest, only opportunities to differentiate something that is so fundamentaly different from ICE products. And plenty can change between now and lets say 200 years from now, when ICE no longer exists. Certainly far longer than "a few years" from now anyway. So then, how does that implicate Lincoln you are probably wondering. I believe that slapping a different badge with highly differentiated sheet metal on both a Ford and Lincoln, is not going to work any longer for EV. Certainly not in the eyes of Wall Street. Something far more unique and revolutionary than that needs to happen. I am not sure yet just what, but if they continue to do what they have done in the past, again and again, then shame on us for anticipating radical change. It will be business as usual. Even if it surpasses everyone in range, which means little in the big picture. Anyway, I of course could be way off and things will be like they always have been, albeit with more electric motors. But I am having a hard time accepting that as a viable solution in the long term. Curious why you think a new brand would be best? Ford has a history of walking away from product names in the hopes a simple name change will disinfect the brand itself. Unless you believe the Ford brand is tarnished I fail to see how launching an all new brand benefits Ford Motor Company more than moving the Ford brand into the future itself. As for the "Team Edison" naming, I think it's clearly meant to draw comparison to the competition that existed between Edison and Tesla in their heyday, and point clearly to whom they're in fact focused on! I approve! Ford family shareholders aren't going to allow any new brand take the lead, period. This has to be an internal development code. The words "Skunk Works" never showed up on any Lockheed aircraft. 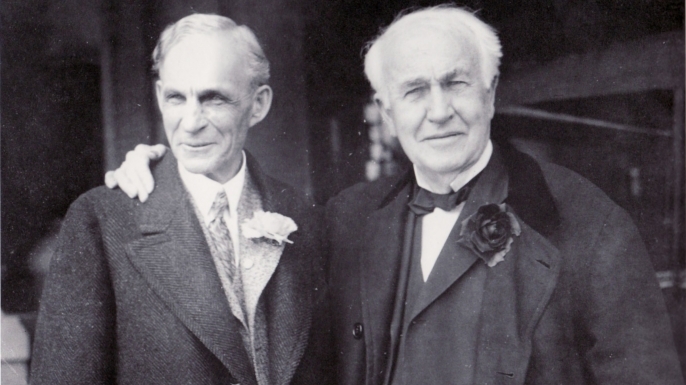 Please, please tell me you are not suggesting Edison is less in some way than Tesla. Edison was a prolific inventor and possibly the biggest change agent in modern history with 1100 patents. He invented things that never existed which most have profoundly impacted modern living. Hardly in the same freaking universe. I like what I'm hearing although it opens up more questions about the state of their product development. Not at all. Just saying that the moniker was Hackett's (representing Ford the automaker) way of punching back at Tesla (the automaker). I know that back in the day Nikola Tesla was competing for mindshare with Thomas Edison. Before he went off the deep end with his Tesla Coil, Nikola licensed alternating current (AC) electricity distribution system to Westinghouse which beat out Edison's direct current (DC) system. So don't be so quick to relegate Tesla to the dustbin of history. Sure, Edison won the mindshare battle just as GE eventually outclassed Westinghouse; I get it. Hey Wings, we have different opinions on a lot of things vis-a-vis Lincoln but you don't have to fight me about everything. A Model E sold under the Team Edison brand, is starting to make a lot of sense. Unfortunately, Ford offering a Model E when the current global EV leader/Tesla have the Model (letter) naming convention creates a marketing conflict. This could be like Burger King offering McFries when McDonald's owns the Mc(product) product naming identity. It would also always be perceived as a tacky rip-off. Ford is better than that.